Eighth-Annual Harker Cancer Walk Raises Over $12,000 for Camp Okizu! On March 14, the Harker community united for the eighth-annual Harker Cancer Walk. The symbolic effort, held on the middle school field, netted more than $12,000 for Camp Okizu, a record-breaking total. “It was an unprecedented amount. We have never cleared the five-digit figure before, but this year we … shot past it like a rocket. That’s enough to send as many as 15 children to Camp Okizu, which makes me so delighted, I can’t keep from smiling!” enthused Michael Schmidt, middle school computer science teacher. He had the idea for the fundraiser following the passing of his mother due to cancer. 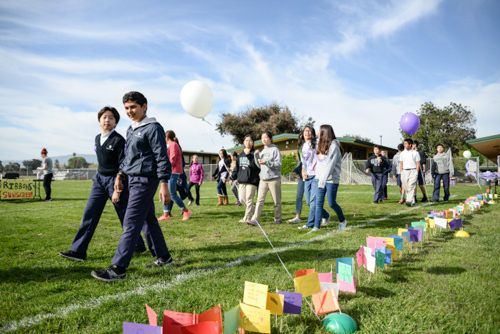 Students, parents, faculty, staff and family members from all of Harker’s campuses walked in support of Camp Okizu, which for more than 30 years has provided peer support, respite, mentoring and recreational programs for those affected by childhood cancer. “This very special summer camp provides the facilities of a hospital, while also providing wide open countryside and camp activities to the children and their families. It’s a place where campers can run, swim, kayak and just be a kid. It costs roughly $700 to $1,000 to send one child to this camp,” reported Schmidt. Participants wore ribbons and music played throughout the event. To supplement direct donations, volunteers sold T-shirts, water bottles, Jamba Juice, baked goodies, temporary tattoos and wristbands. In a special activity following the walk, all of the advisories made gifts for camp members. Harker students diligently prepared some 150 wooden photo frame decoration kits for use by campers and their families. “Eight years ago, we started an event at the middle school called the Harker Cancer Walk. It brought the entire campus together in the name of cancer awareness. Cancer is a disease that is vast and, in one form or another, touches nearly everyone. It can be a heart-wrenching experience when neighbors, co-workers, friends and loved ones are struck with this potentially devastating diagnosis,” said Cindy Ellis, middle school head. Ellis explained that prior to the event, advisories had been busy decorating the “biggest Cancer Walk poster ever created.” The result of the collaborative effort – a poster that was 8 feet tall by more than 30 feet wide – hung on the gym wall from March 10-14. “Harker was good enough to let me start this event after my mom passed away in 2006 and it has been used as a healing process for me and many others over the years. I’m honored to keep up the tradition,” said Schmidt. Located in the Berry Creek area of the Sierra Foothills and mirroring a residential camp experience, Camp Okizu provides a safe place for young cancer patients to enjoy regular camp activities and social events. The name Okizu (oak-eye-zoo) comes from the Sioux language and means unity. For more information about the camp, go to: http://www.okizu.org/about.